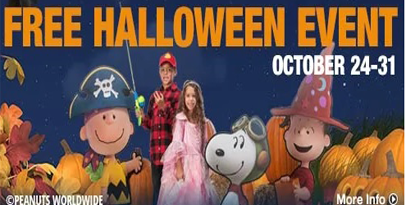 Bass Pro Shops FREE 2016 Halloween Event is October 24-31. Get a FREE 4×6 photo with the Peanuts Gang and More! FREE Light up pendant to the first 100 kids to have a photo taken. With every photo, get a FREE kid’s entrée at Bass Pro Shops locations with a restaurant. COSTUME PARADE – Participants will receive a plush jack-o-lantern.